With a raft of designs from the past to draw on, we suspect Supro is back for the long haul. We certainly hope so - we haven’t had as much fun as this for ages! No gigbag or lefty option. While Valco’s backstory is complex, and its roots lie in the National and Dobro companies back in the 1930s, it is the start of the 50s - 1952, to be precise - that interests us here. This is when Valco entered the solidbody electric guitar market and where, over the next decade and a half, it would create some of the most out-there and often innovative designs ever plugged into an amplifier. 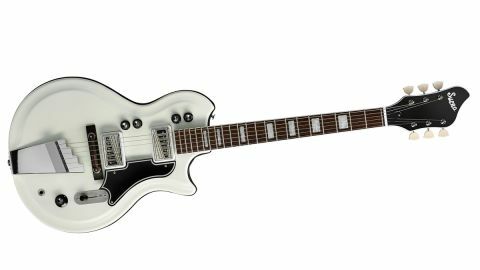 The semi-hollow body, with a thick overall depth of 48mm, is split in two halves and separated by a white or black (depending on body colour) rubbery plastic gasket. the loading of the tone control. Aside from being bigger-bodied than the Island series, the Americana guitars (Dual- Tone and Coronado II) have slightly thinner-depth necks, but are still nicely shaped with a flatter C profile. These necks are bound in a bright white plastic and the fret gauge is pretty similar in width, although these are just a touch lower. Intonation is a little funky, although you can move the treble side to get more precise intonation. The post spacing suggests you could retrofit a tune-o-matic and then really secure the base. a shade more attack and single coil-like percussion than the Island series. The construction seems to add a little more girth and depth that sits on the fuller, less attacking side, compared with our Strat, and sounds like a ‘lower wind’ version of a dual P-90-equipped PRS SE Semi-Hollow, which is a little fuller in the lower mids. Again, though, there’s plenty of jangle here in cleaner settings, very rockabilly and early rock ’n’ roll. The Americanas do a great job of replicating the originals, adding a better neck joint and an adjustable truss rod, although the wooden bridges and the lack of easy access to the electrics might bother some. There are limited colours available on the Americanas and no lefties in either range. There are no included gigbags, either, which doesn’t help the impression that these guitars are on the high side, price-wise. But Valco’s original guitars were never a head purchase, were they? They were about the heart, and these have both character and vibe in spades, not least in the sound department - a voice that, if not forgotten, is certainly overlooked, and extremely valid for the player looking back to the 60s to create different and new sounds.